Service was excellent. People at the desk always very helpful. 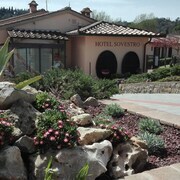 Where to find San Gimignano hotels near an airport? 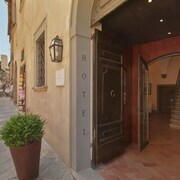 Where can I find hotels in San Gimignano that are near tourist attractions? If you are deciding on where to spend the night while vacationing in San Gimignano, you'll find a wide array of suitable possibilities. Within our handy accommodation pages you can find 112 accommodations within a 0.1-kilometre (0.06-mile) radius of central San Gimignano. 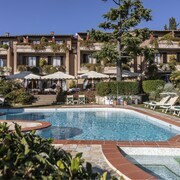 Experienced vacationers who understand the convenience of booking a hotel close to the action and bright lights of the city's heart should check out the Relais Santa Chiara Hotel and Locanda Viani, all of which are located within 1 kilometre (0.6 miles) of San Gimignano's downtown. The La Collegiata and the Villasanpaolo are conveniently located if you'd like to stay near the Collegiata di San Gimignano. The La Collegiata is 2 kilometres (1 mile) away from the Collegiata di San Gimignano. The Villasanpaolo is 3 kilometres (2 miles) away. If you're traveling on a budget, you will be pleased to know that there's a nice selection of cheap and cheerful hotels and apartments in San Gimignano. 7 kilometres (4 miles) away from San Gimignano's downtown is the Country House Fattorie Santo Pietro. The Al Pozzo dei Desideri is just 0.1 kilometres (0.06 miles) away. The Fabio Apartments and the Casanova di Larniano are alternative cheaper accommodations that you could look into. You could check out the Castello del Nero Hotel & Spa or the Castello Di Casole. The Castello del Nero Hotel & Spa is positioned 15 kilometres (9 miles) from the center of San Gimignano. The Castello Di Casole, is located 16 kilometres (10 miles) away. Two other Expedia-listed options in the area include the Villa Mangiacane and the Relais La Suvera. Looking for more things to do? Why not spend the day visiting Archeological and Collegiate Church Museum and Torre Rognosa, which you'll find in Val d'Elsa, 9 kilometres (6 miles) to the southeast of San Gimignano. Some of our recommended Val d'Elsa accommodation options include the Tenuta Di Mensanello and Torraccia di Chiusi. 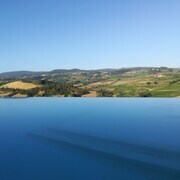 Or stay in Val d'Orcia, 70 kilometres (42 miles) to the southeast of San Gimignano, where you can choose from the Adler Thermae Spa & Wellness Resort and Hotel Osteria Dell Orcia. The Collegiate Church of San Quirico and Palazzo Chigi are a couple of the more popular sites to check out when visiting Val d'Orcia. For travelers planning on arriving or departing via Peretola Airport, you can book accommodation at The St. Regis Florence, or The Westin Excelsior, Florence, which are both conveniently close. What are the most popular San Gimignano hotels? Are there hotels in other cities near San Gimignano? What other types of accommodations are available in San Gimignano? 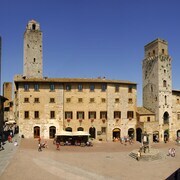 Explore San Gimignano with Expedia.ca’s Travel Guides to find the best flights, cars, holiday packages and more!